Birds need a lot of stimulation. Working on puzzles, playing basketball and doing other fun things with their human companion goes a long way to having a happy well adjusted bird. These trick training bird toys will have your bird putting on shows for all your friends to see. Educational bird toys help your bird stimulate their natural intellect since birds have the intelligence of a 3 to 4 year old child. 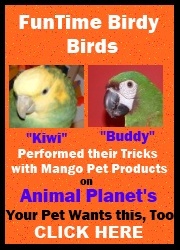 What a great way to bond with your bird while helping them expand their intelligence and confidence. I truly believe that birds have an innate sense of pride once they have mastered a trick or an educational game much the way we do when we have mastered a skill. I have seen this first hand with our Severe Macaw "Buddy". If you click on our Basketball Trick Training Toy you will be able to see a YouTube video of our Severe Macaw "Buddy" playing Basketball. He is really proud of himself as I am of him!